OER17 – Come and find me! 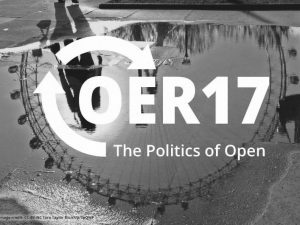 The OER17 Politics of Open Conference is taking place in London this week, and I can hardly believe it’s been a year since Melissa and I chaired last year’s conference in Edinburgh! As always, I’m looking forward to catching up with friends from all over the world and meeting some long standing online colleagues irl for the first time. I’ve got several sessions lined up up over the course of the two days, so if you want to catch me, this is where I’ll be. Come and say hello! Like the Internet itself, the Open Education movement, including OER and OEP, has grown in a world of globalised capitalism that has been dominant in North America and Europe, and indeed, developed and growing economies. The Brexit vote, Trump’s election, and shifts toward nationalist-right parties elsewhere are changing the political landscape. At a minimum, the rhetoric of these movements, both in support and opposition, has altered public discourse and often attitudes toward higher education. These political shifts have complex and multifaceted implications for the open education movement. What challenges do these political movements pose for Open Education? What opportunities? Open Education movement has largely embraced values of inclusiveness, sharing, connectedness, equity, voice, agency, and openness. How might these values be furthered under these new regimes? How might these values be hindered? Will our work in the open education movement change? In what ways can we shape the future of the Open Education Movement? Ten years ago the Cape Town Declaration laid the foundations for what it described as the “emerging open education movement” and called on colleagues to come together to commit to the pursuit and promotion of open education and to overcome the barriers to realizing this vision. Among the barriers the Declaration recognized were “governments and educational institutions that are unaware or unconvinced of the benefits of open education” and it went on to advocate the development of open education policy to ensure that taxpayer-funded educational resources are openly licensed. Five years later, the Paris OER Declaration strengthened this call by encouraging governments and authorities to open license educational materials produced with public funds in order to realize substantial benefits for their citizens and maximize the impact of investment. This paper will provide an overview of the advances and mis-steps in open education policy and practice in the UK in the ten years since the Cape Town Declaration, while comparing and contrasting the UK experience with developments elsewhere in Europe and North America. The paper will include a case study on the Scottish Open Education Declaration and the efforts of the Open Scotland initiative to lobby the Scottish Government to endorse the principles of the declaration and adopt open licenses for publicly funded educational content. End of day session, from 1730-1800. With onsite buddy Teresa MacKinnon and virtual buddies Nadine Aboulmagd and Simon Ensor. This lightning talk will be a short polemic reflecting on political and personal events that have led me to both question and strengthen my commitment to open education over the last two years. These include the detention and disappearance of Syrian open knowledge advocate Bassel Khartebil, and the project that created an open book dedicated to his life and work The Cost of Freedom: A Creative Enquiry. The privilege of co-chairing the OER16 Open Culture Conference. The result of the UK’s European Membership referendum, announced the day after a meeting of European colleagues to discuss how we could work together to join up open education policy and practice across the Europe. The appointment of the first Gaelic language Wikimedian in Residence by Wikimedia UK and the National Library of Scotland. The surge of horror and shout of rage following the results of the US presidential election. My response to these disparate, seemingly unconnected events was to write, to blog, to try to find words to make sense of events and my reaction to them, and to reassert my belief that we have a moral responsibility to work together to improve education opportunities for all, not just the privileged few. I can’t promise this talk will be neutral or balanced, but it will be honest and from the heart, and ultimately it will be open. This entry was posted in higher education, oer, policy, politics and tagged higher education, oer, oer17, open, OpenEdFeed. Bookmark the permalink.